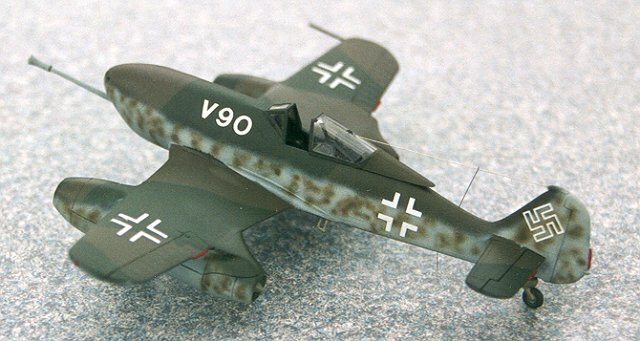 Actually, the Focke Wulf firm really did design a projected version of the FW-190A fighter powered by a Jet engine. Surviving factory drawings show an extension of the radial engine cowling with a Junkers Jumo turbojet engine installed. Exactly where the jet exhaust was supposed to come out is not clear, but there is one vacuform conversion available of this “odd mod” and it would not be difficult to scratch build the conversion. It remained, however, only a project, and no flying prototype, or even mockup, was ever built to my knowledge. However, the FW-190A, FW-190D, and the later TA-152H would have been successful candidates for jet engine conversions, basically in the manner of the Russian Yak-15 fighter and the Messerschmitt Bf-109TL prototype, which was destroyed in a bombing raid before it could be test flown. Therefore, I didn’t let the fact that these projects never existed stop me from speculating and building them. I’ve visited the Luft46.com website, and I know what the Germans were capable of. The first project was a conversion of an old Heller FW-190A which has been in my box of scrapped models for a number of years. The kit shows its age, but is reasonably accurate in outline, so I figured, why not? I started by removing the landing gear, tailwheel, cowling firewall forward, canopy, and anything else that would break off anyway during the conversion process. Now I was ready to go to work. The idea behind the FW-190J-V89 was a conversion using the basic airframe coupled to a jet engine in front, Yak-15 style. However, I felt that a Junkers Jumo 004 would produce an underpowered airplane, so I opted for the twin jet installation of the BMW 003 in a paired installation as used in the Arado AR-234C jet bomber. I just happened to have one of the units from a scrapped Frog AR-234 kit, so I was off and running. as the idea was to produce a jet fighter using as many existing components as possible, and changing the landing gear would have resulted in too many structural alterations to suit the RLM at that stage of the war. I extended the tailwheel and installed a long protective cover to protect the tire and assembly from the jet exhaust. The tailwheel is semi-retractable. The engines were mounted and the nose was contoured to form a reasonable aerodynamic shape. The airplane looks strange with the twin jet engines mounted on the nose, but the arrangement is entirely logical. I used card plastic and putty to shape the nose, and the result was acceptable, although it was a lot of work. The airplane has a somewhat Arabic look. The canopy of my scrapped kit was long gone, but fortunately, I had just finished a new Aoshima TA-152H-0, and that kit provided two canopies, one opened, and one in closed position, and as luck would have it, the canopy fit the Heller kit perfectly. It is the blown hood version, the type that would have been used in a real-life conversion, so the result was realistic and believable. Leaving the canopy closed meant that I did not have to do extensive detailing in the cockpit area, since it would be hard to see after the canopy was in place. And besides, this was a rebuild project, not a new kit, so the cockpit area was not too accessible anyway. With a little patience, the plane slowly took form, and by the end of the second week, it was ready for painting. I used a 75/81 topside scheme with 81 mottling on the sides, with 76 undersides, a typical scheme for late war Luftwaffe fighters. I just happened to have the letters V89 in my spare decal box, so that became the designation of the aircraft. I did not install any armament, as the aircraft was a proof of concept flying prototype, not a fighter prototype. In production models, armament would probably have to be mounted in the wings. Four 30mm cannons would have given this aircraft devastating firepower equal to that of an ME-262. RATO units would have helped the airplane take off from short fields, and the aircraft would probably have been an effective fighter and bomber destroyer. Landing and takeoff speeds would have been high, much higher than the standard FW-190A, so a two seat conversion trainer might have been necessary. Slow acceleration, a major problem for the low thrust jet engines of the period, might have limited the operational usefulness of the new fighter, but it probably would have approached the ME-262 in effectiveness, and it certainly would have been much less expensive to build. And I’m the only kid on the block that has one, so far. And then I found a SECOND Heller FW-190A in the spares box. It was also calling out to me to be converted into a jet fighter, so I gave in and started my second conversion, the V90. This aircraft closely follows the pattern of the Messerschmitt Bf-109TL jet conversion, except that it is a much simpler conversion and would be more suitable for close support duties. The FW-190J-V90 used two underslung Jumo 004 jet engines, similar to the installation on the ME-262. In fact, the airplane is very close in concept to the early tailwheel prototypes of the ME-262. The only aerodynamic changes required would have been a new nose section where the radial engine had been, and a definite strengthening of the wing spars to accommodate the jet engines just outboard of the landing gear attachment points, and just inboard of the ailerons. The result is more esthetically appealing than the nose mounted engines, and probably simpler to produce. In short, it “looked right”. I started by removing the breakable parts of the model, as it was nearly complete when I started. I then began removing the nose ring with a razor saw, being careful to cut a straight line even with the cowling ring. Once this was cut and sanded smooth, and after removing the bulges on the side of the engine cowling, I added the nose of an Airfix DeHavilland Mosquito, which was pretty close to the nose contours I wanted, and in addition, had four small holes arranged for the .30 caliber machine guns carried by the British aircraft. I left those open, as I had ideas for the armament. After a pretty extensive coat of putty, the nose contours were sanded smooth, and the aircraft began to take shape. Now for the engines. I had originally planned to use the extra jet engines from the Huma Heinkel HE-280 kit, as they provide about four different sets of engines for the one kit. However, after going through the spares box, I came across the Jumo pods from a Matchbox ME-262A, which were just about perfect for the wing locations on the FW-190A. I trimmed down the attachment points, and glued them directly to the undersides of the wings. The result was a very realistic installation. A little putty was required to fill in the gaps, and the job was done. It is about as clean an installation as the one on the ME-262, and would probably fly similarly to the original tailwheel prototypes. The landing gear was the next step. I used it without modification, although I did extend the tailwheel similar to the FW-190’s that were tested experimentally with large torpedoes slung underneath the fuselage. I reinstalled the ETC fuselage rack for a fuel tank or weapons load. a quartet of MG151’s, the firepower in the nose was adequate for close support and also bomber interception. This same weapon was tried out in an ME-262, but the results are unknown. Finally, the aircraft was ready for painting. the canopy was masked, and a coat of 81 was applied to the upper surfaces. A wavy pattern of 82 was applied after masking off the base color, and 76 was sprayed on the undersides, fuselage sides, and the vertical tail surfaces. 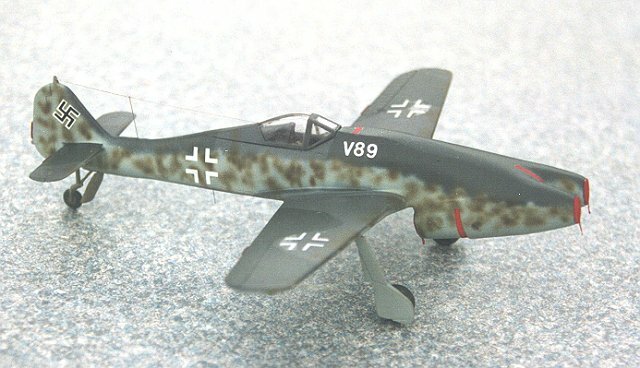 Side mottling was done with a combination of the two top colors, and a typical Luftwaffe late war scheme was achieved. White and black outline crosses and swastikas were used, with the inscription “V90” in white just ahead of the cockpit. the bombers didn’t fly that high (B-29’s, although predicted, were Tojo’s problem, not Hitler’s) and Russian and American tanks were a major priority at that stage of the war. A production model would undoubtedly have had a tricycle landing gear. The point of scale modeling seems to be to have fun. Building an accurate replica of an airplane or military vehicle is very rewarding, but I have always felt that modeling should also reflect a person’s creativity and imagination. The question always comes out “What might have happened if.....” and we start from that point. And besides, somebody might really believe that the aircraft actually existed. When the Airfix FW-190A kit first appeared in the middle seventies, I was faced with a problem. 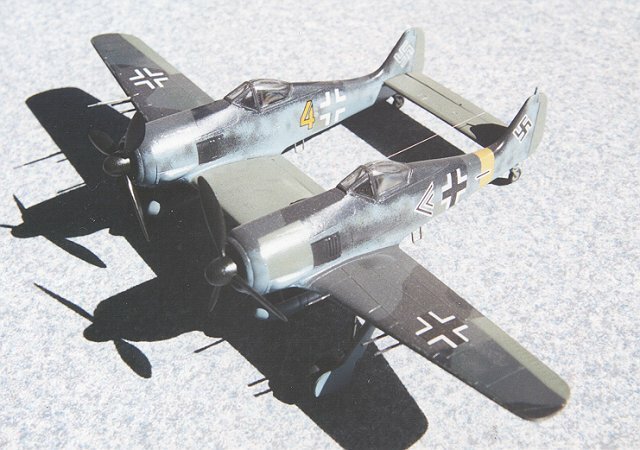 Having always been an admirer of Kurt Tank’s masterpiece, the radial engined FW-190A, I had a fair number of Matchbox FW-190A-3/4 kits on my shelf, and the question arose--what to do with them. I had built quite a number of them, and they were really nice models although they did not exude the explicit detail we now accept as standard. I had actually scrapped several of these models, and therefore decided to used these scrapped kits to build a model of an entirely feasible, but non-existent prototype of a twin engined fighter. Messerschmitt actually constructed a prototype, the Bf-109Z “Zwilling” twin engined long range fighter, by coupling the fuselages of two Bf-109F’s to a common center section and elevator/stabilizer unit, and there was no reason why Focke Wulf could not have done the same. The concept was basically sound, as the Germans used the idea to produce the HE-111Z glider tug, and the U.S. Army North American P-82 “Twin Mustang” proved to be an outstanding long range fighter well into the Korean Conflict. So, I figured, “Why not an FW-190Z”? so I retained the two cockpits and pilots, but installed a reliable intercom for obvious reasons. I added several twin 20mm cannon installations under the outer wing panels, bringing the total of forward firing 20mm cannon to 12, making it a potentially deadly close support and anti-bomber aircraft. In addition, installation of a pair of 3.7 cm. anti-tank guns as carried by the JU-87G would have made it an excellent tank killer. As a twin engined fighter, the FW-190Z would have probably had better performance that either the ME-110 or ME-410, in addition to vastly improved armament. It would have been cheaper to build, and since most of the parts were standard FW-190 units, production could have been initiated without undue interruption of existing production lines. The FW-190Z-V1 is a very interesting looking airplane, and certainly doesn't look out of place in my collection of over 70 FW-190 models. It was fun to build, and it's fun to see people look at it and wonder what it is.